Reduces the appearance of wrinkles and fine lines;Increases skin firmness;Leaves the skin more luminous, moisturized and matified;Reduces the appearance of brown spots;Decreases the appearance of the pores. 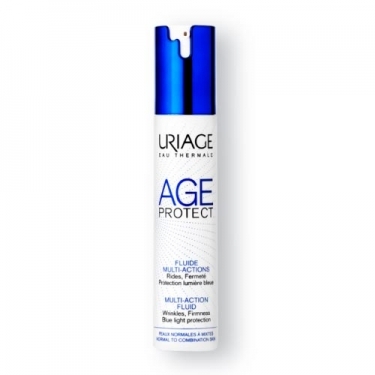 Age Protect Fluide Multi-Actions from Uriage is a slight enhancement fluid that acts on the signs of age and on the external aggressions to which the skin is subject daily such as blue light, UV radiation, pollution, stress, fatigue, among others. It reduces the appearance of wrinkles and fine lines while fighting loss of firmness and lack of filling and also prevents the appearance of brown spots and restores the vitality and luminosity of the skin. Enriched with AHA, extracts of rose fruit and cellulose for a matifying and purifying action by reducing pore size while fine-tuning the grain of the skin, for a noticeably smoother complexion. Suitable for normal to mixed skins. Apply in the morning on the face previously cleaned and dried. Avoid contact with eyes.